Gates open at 10 a.m. for the music festival which will feature opening acts The Calhouns, McKinley and Beggs, Rob Nichols, Norman Lee, and Donna Moore. The Judds are scheduled to appear at 3 p.m. at the 400-acre outdoor venue located midway between Orlando and Ocala and just eight miles from The Villages. The concert, taking place at the equine-inspired Grand Oaks Resort, will benefit the Alliance Healthcare Foundation, a not-for-profit organization that provides philanthropic support for Leesburg Regional Medical Center and The Villages Health System. Tickets are $35 lawn seating, $60 guaranteed general admission seating, and $125 VIP preferred seating. All major credit cards are accepted. For directions to the resort, visit http://www.TheGrandOaks.com . Tickets are available through http://www.ticketmaster.com or by calling 1-800-745-3000. From an early age, Wynonna recalls her mother encouraging her and her siblings to be contributing members of the community. “The most important gift we can give anybody is kindness,” says Naomi. “I think we’re here to grow and love and be of service.” So it’s no wonder that the duo wholeheartedly agreed to the benefit concert to support the Alliance Healthcare Foundation. “It was an absolute yes,” Naomi says. “Fundraising events such as this concert and those we have planned for the future are essential for the progress and growth of our hospitals and the services we provide,” said Williams. “With the challenges of operating a successful contemporary health care organization, the need for broad gift support from our friends in the community is greater than ever before. 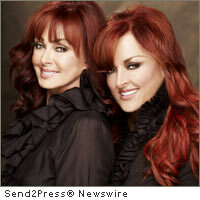 The Judds have won over 60 industry awards – including five Grammy Awards – and will sing classic breakout hits including “Mama, He’s Crazy,” “Why Not Me,” “Love Can Build a Bridge,” “Girls Night Out,” and “Grandpa (Tell Me ‘Bout the Good Old Days).” Wynonna will also perform some of her biggest hits. The Alliance Healthcare Foundation (cfhalliance.org/giving_overview.htm) is a not-for-profit Foundation which provides philanthropic support for Leesburg Regional Medical Center and The Villages Health System in Central Florida. The Foundation’s mission is to provide a margin of excellence for quality healthcare in the communities served by these hospitals through fundraising, friend-raising, leadership and donor engagement. Original Keywords: Ted Williams, The Alliance Healthcare Foundation, philanthropic support for Leesburg Regional Medical Center and The Villages Health System in Central Florida, The Grand Oaks Festival featuring The Judds Alliance Healthcare Foundation Lady Lake Florida LADY LAKE, Fla.
REFERENCES: Entertainment News, Ted Williams, The Alliance Healthcare Foundation, philanthropic support for Leesburg Regional Medical Center and The Villages Health System in Central Florida, The Grand Oaks Festival featuring The Judds Alliance Healthcare Foundation Lady Lake Florida LADY LAKE, Fla.